Would you like to explore Banff on horseback? Join us for a one or two hour ride. Or try our Evening Steak Fry and horseback ride, which combines the Sundance Loop Ride with a full steak dinner cooked for you in the back country. Exploring the Canadian Rockies on horseback is a fun and adventurous way to experience the beautiful park scenery. 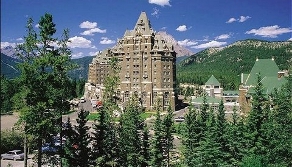 Banff Travel offers a wide variety of packages to suit the needs of every rider. Riding packages range from a few hour excursions to multiple day retreats. Riders can choose to participate in the Mountain Morning Breakfast Ride or Evening Trailhead and Steakfry, which both include a delicious home-cooked meal at the end. For those who are not interested in riding, there is a covered wagon that follows the tours. 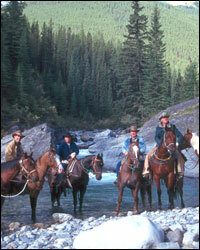 True horse lovers can enjoy multiple day horseback excursions into the Canadian Rockies wilderness. Each excursion is led by an experienced cowboy for optimal safety and comfort.